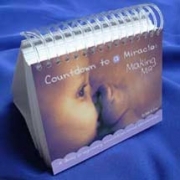 Countdown to a Miracle Pregnancy Calendar Discounts Apply ! The absolute best pregnancy calendar we have found! When we were pregnant with twins, we started each day with a glance at our daily pregnancy calendar. We would look at the day and say "the guys are growing toes today" or "They can hear us today". What an incredible way to start your day! While books on the week-by-week pregnancy are great information resources, we believe that a daily pregnancy calendar is truly a pregnancy essential.